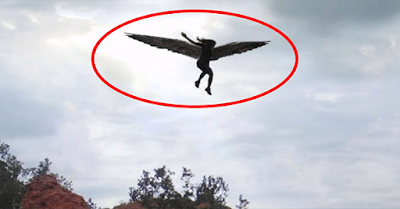 MUST WATCH: Angels Surprisingly Caught on Video Creating Miracles on Earth? Since we were young, we have always been told several stories about angels and demons. Our parents sometimes use these fictional lines to threaten and create a sense of fear, for us to follow their reprimand. The Bible has its own accounts about angels. They are sometimes a messenger from heaven or an entity that God sends to give us a warning. This video, however, shows certain recordings of angels sighting. People who recorded the videos claim that they have seen angels themselves, and experienced miracles during the appearance. In one segment, a man was nearly facing death by a vehicular accident, but a light forming an image of an angel suddenly saved him. It will really give you goosebumps. There are really times that will make you wonder how we are being saved from danger. Some say that it's just luck, but many would agree that it's divine intervention. It's just a matter of deciding if you will believe in His grace or not. In spite of all, we should always be thankful that we have someone who shields us from any harm.